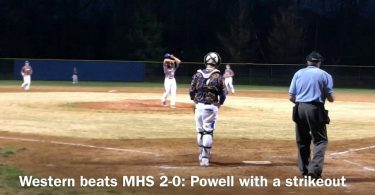 Powhatan’s baseball team edged ahead of Fluvanna County in the fourth inning, taking a one-run lead over the Flucos. Clearly, Fluvanna didn’t panic, rallying in the bottom of the sixth to score three runs and then hold on for a critical 4-2 Jefferson District victory at home. A Ryan Groome walk followed by a Jacob Critzer single helped get the surge started. 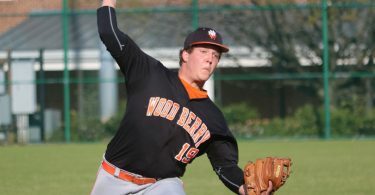 Kevin Ward doubled to right to tie the game as Groome crossed home and then Cameron Shields provided the eventual game-winner with a single to center scored Ward and Critzer. That was all the offense the Flucos needed with Andrew Ward in good shape on the mound. Ward struck out nine in five innings of work while allowing just the two runs on four hits and three walks. Toby Sherman and Kyle Algieri closed the door on the Indians in the sixth and seventh with Sherman allowing three hits and striking out two while Algieri needed just seven pitches to escape the seventh unscathed. Powhatan hit into a fielder’s choice before Algieri surrendered a walk to load the bases. He then got the Indians to ground into a 5-3 double play to preserve the win. Algieri finished the day for 2-for-3 at the plate while Critzer also went 2-for-3 with an RBI, a solo shot in the first inning. He also scored a pair of runs scored. Brandon Eike finished 1-for-3 with a double, a run scored and an RBI to lead the way offensively for the Indians. Hayden Wasson, Cameron Sprouse, Connor Woodel, Tanner Ritt and Aiden Voorhees each had hits for the Indians. Tymothy Hart struck out three in 5.2 innings of work on the mound.